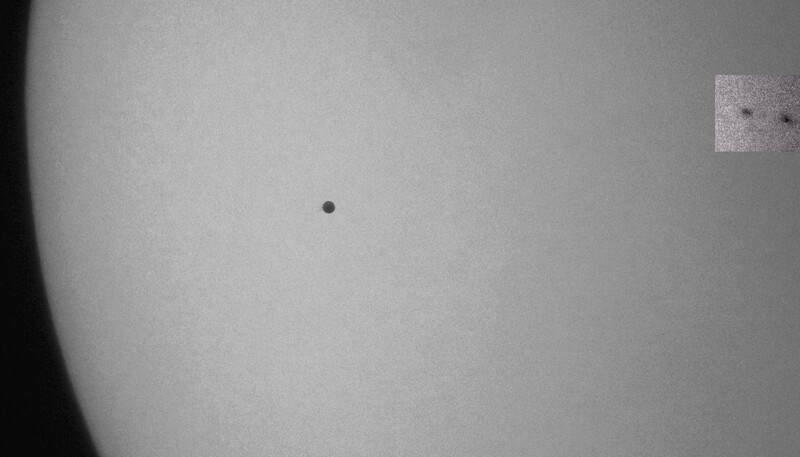 2016 May 09: Transit of Mercury. Report from Rousay. As with the 2003 Transit of Mercury 0f May 07, the entire event was observed from Rousay. Whereas in 2003 the first and final contacts both took place before noon, this year (2016) first contact occurred with Sun and planet close to the meridian and at a higher altitude. This afforded better image quality than in 2003 enabling higher powers to be used on the telescopes to assess the timing of first contact. This year the duration from first to final contact was 07h 28m compared to 05h 17m in 2003. Even so, the Sun's altitude at last contact this year was somewhat greater than the first contact in 2003 so that overall conditions were more favourable in 2016. In 2003 we employed a single 100mm aperture anchormat, whereas this year we had three instruments in use two on electrically driven equatorial mounts. The 120mm f/7.5 apochromatic was fitted with a Baader solar filter stopped down to 95mm aperture for imaging and a Polaroid filter on full aperture for visual observations. Powers used ranged from 35x to 180x. The 100mm apochromatic f/9 fitted with a glass Orion Solar filter at power 45x for full-disc imaging. 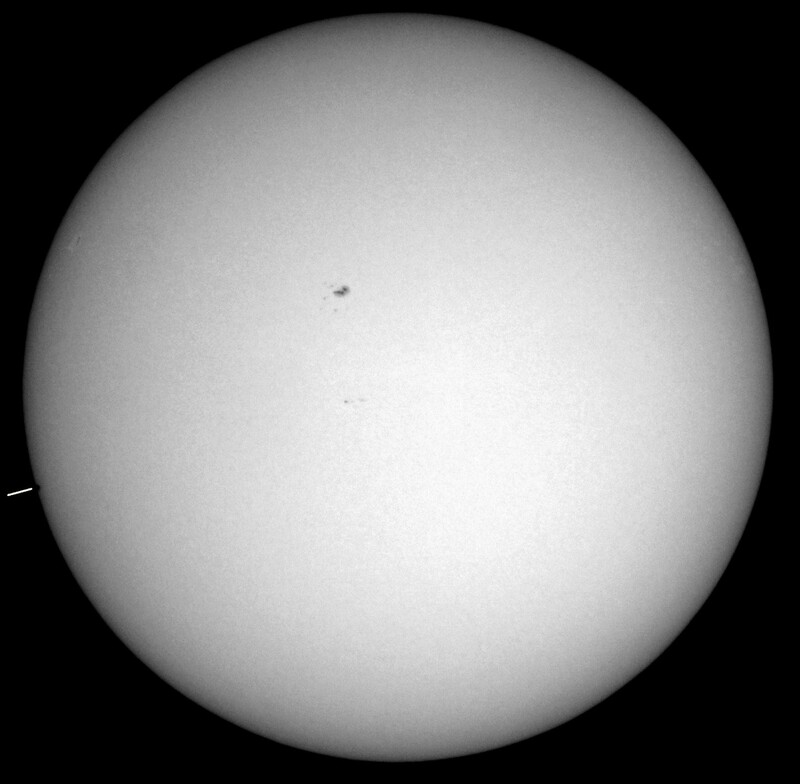 The position of the Sun for the hour leading up to final contact was not accessible from the main observing site so that a portable 100mm achromatic refractor was used on a firm tripod equipped with Orion glass filter working at 45x. General Observations: Atmospheric conditions throughout the day were of moderate to good transparency (some haze at times); seeing quality fair to good but seldom outstanding. To secure clear mages of the Sun is a somewhat hit and miss affair with rapidly changing seeing quality at the best of times. However, there are brief moments of good seeing enabling fine detail to be recorded on the Sun in visible (white) light—sunspots, faculae. 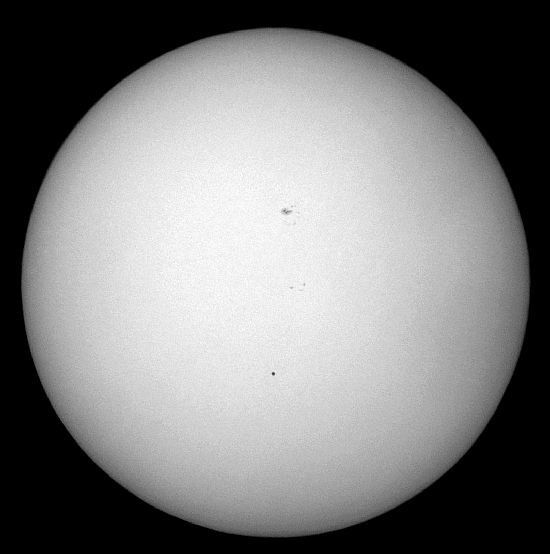 A transit of the Sun by Mercury and Venus, but Mercury in particular, affords a unique opportunity to assess the quality of the imaging process since, unlike sunspots, the planet presents a clear, sharp, black subject. Contacts are very challenging. First contact this year took place, as we remarked, with the two objects at a good altitude above the horizon. To time this event required visual observations at relatively high powers with an accurate knowledge for position on the solar limb. One just had to hope for reasonable seeing and this was the case this time. With the Sun’s limb for reference, it was quite impressive to see how quickly Mercury advanced onto the disc, despite the whole event taking over 7 hours. In all we secured over 600 images. First contact 09 May 2016 11h 12m 06s Sun's altitude: 47° 9' 29"
Last contact 09 May 2016 18h 40m 13s Sun's altitude: 11° 9' 17"
For comparison we give data for the 2003 transit below. First contact 07 May 2003 05h 14m 23s Sun's altitude: 8° 4' 59"
Last contact 07 May 2003 10h 31m 23s Sun's altitude: 44° 17' 33"
Duration of Transit: 05h 17m 00s approx. 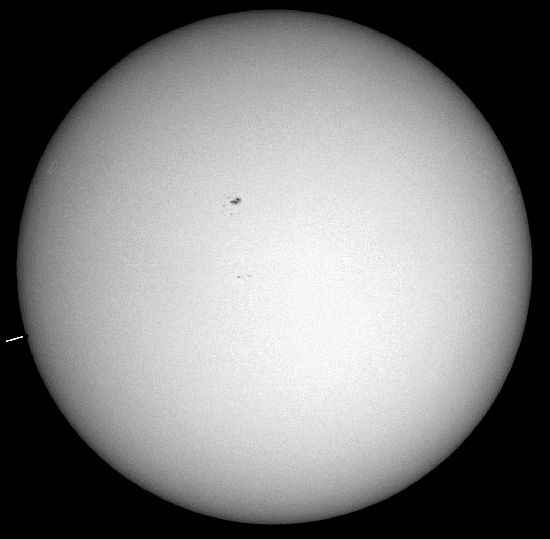 Actual observational data from Springfield: first image 05h 12m UT, final image 10h 27m UT. White lines show location of contacts. These are not, of course, the very first and last contacts (see text). 160509 12h 42m 120mm refr. 140x Canon IXUS. 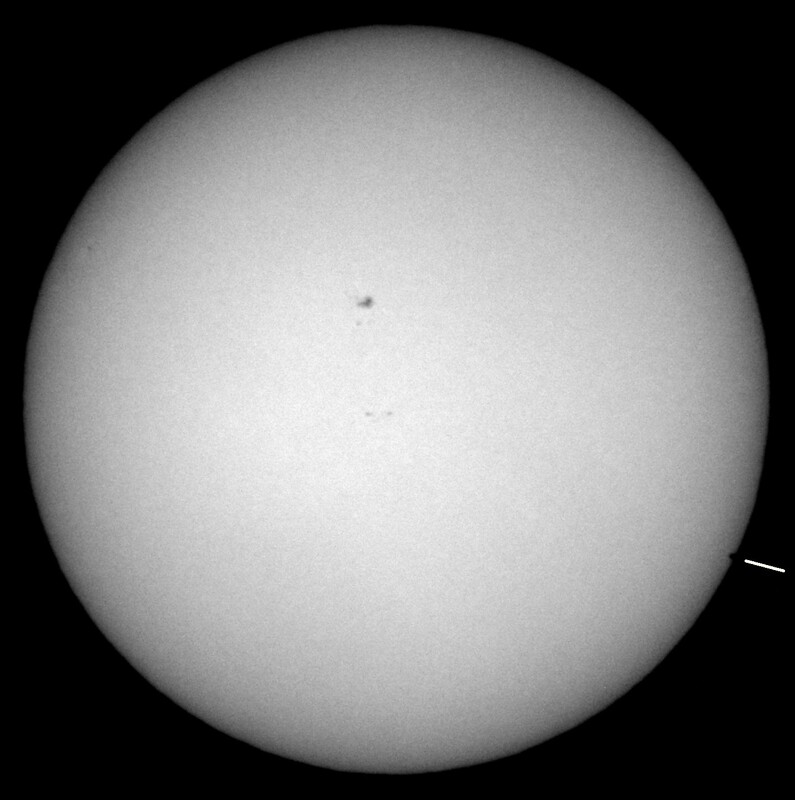 Note: sunspots to the far right highlighted. Without the highlighting Mercury appears black in comparison, since the spot is at a temperature of around 4200° C.
The images have been “corrected” to direct view i.e. top is North left is East and right is West. Left click to enlarge images. All exposures 1/1000 sec with varying ISO values to suit conditions etc. 2019 Nov 11 Only partially visible from Orkney. 2032 Nov 13 Only partially visible from Orkney. 2039 Nov 7 Visible from Orkney in morning (short duration). 2049 May 7 Visible from Orkney (very favourable). 2052 Nov 9 Not visible from Orkney. 2062 May 10 Only partially visible from Orkney (late pm).